Virgil van Dijk has arguably been the best defender in the world this season. 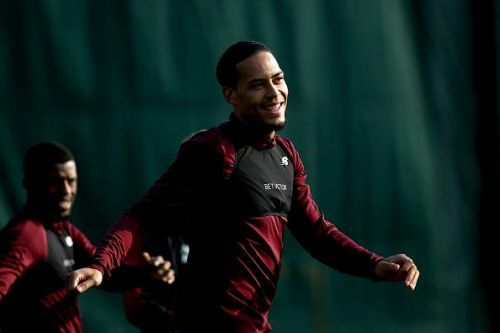 Virgil van Dijk is believed to be the key reason behind Jurgen Klopp's Liverpool currently sitting in pole position in the English Premier League table as well as being the bookies favorite to lift the UEFA Champions League. But how does he compare to the other standout defenders in Europe? Going by the latest stats from WhoScored.com the Dutch captain stands head and shoulders above his competition, both in terms of dominating the box and being impossible to get past for even the best attackers in Europe. The 27-year-old defender has rejuvenated the Liverpool back line since his arrival from Southampton and his leadership and intelligence has seen the Reds concede a meager 20 goals in the league so far, the best defensive record among all the teams in England. Perhaps the biggest indication of his impact on the club's results is the fact that he has won four Man of the Match Awards in this season's EPL- a feat unheard of among central defenders. 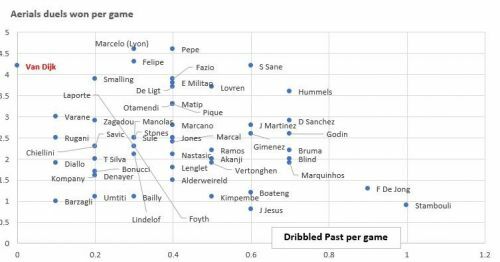 When drawing a scatter graph to best analyze a central defender's attributes, the two most relevant statistics are aerial duels won per game and occasions where the defender was dribbled past per game. While the first relay's the amount of dominance the centre back has in his box, the second illustrates how difficult even the best forwards find it to get past the said defender. As per latest stats - a scatter graph in terms of aerial duels won and occasions where the defender was dribbled past per game (centre backs of UEFA Champions League Round of 16 sides only included) reveals the true picture of Van Dijk's dominance this season in Europe. The Dutch captain is the only central defender among the top 16 UCL sides to never have been dribbled past! The next best in terms of attackers finding them near impossible to dribble past are Real Madrid's Raphael Varane (0.1), Juventus' Daniel Rugani (0.1) and Andrea Barzagli (0.1), and Dortmund'sd's Abdou Diallo (0.1). Liverpool's next match is against Portuguese giants FC Porto away on Wednesday as they look to seal progress to the semifinals of the UEFA Champions League, carrying a 2-0 advantage into the tie. Jurgen Klopp's Liverpool consolidated their position at the top of the EPL table with a sensational 2-0 victory yesterday against Chelsea. Their closest rivals, Manchester City, who are just 2 points behind, however, have a game in hand. The Reds travel to Cardiff for their next EPL match on 21st Sunday. Virgil van Dijk vs Sergio Ramos - Who is the world's best defender?